On December 11th, years 3 and 4 were invited to join in with the Advent carol service at the Baptist Church. Members of the Maghull UCM were very impressed with the enthusiasm and dance moves from our children (especially to the funky camel song!). The children were then treated to juice and cakes. Brilliant behaviour and performance from all children well done! Our year 6 class enjoyed a festive activity day at the baptist church this week. 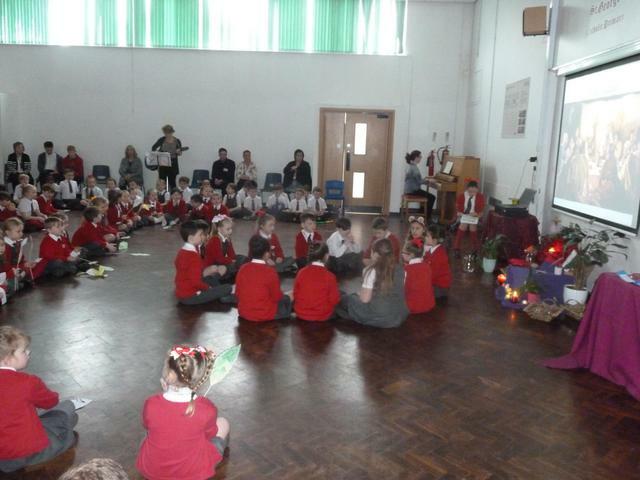 The children learned all about the christmas story and how they can be getting ready for Christmas this Advent. The main theme for the day was 'What is the main message behind the Turkey and the tree at Christmas?' The children all came back into school munching a mince pie! Today every child had the chance to meet Jeremy a Jewish man from Manchester. He helped each class follow their Judaism topic focus from our Come and See curriculum. The children played Jewish games, learnt about the special parts of a Synagogue and the special books that are part of the Jewish religion. Many thanks to Jeremy for a memorable and fact filled day. Every class has been finding their own way of remembering the soldiers on this, the 100 year aniversary of the end of WW1. 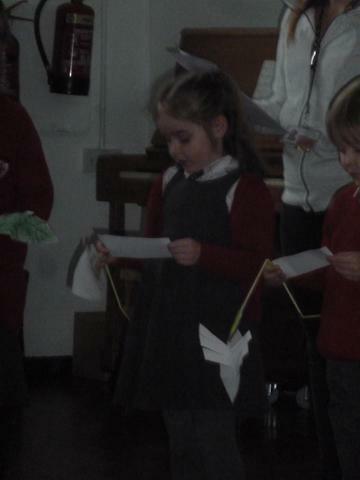 They created poems, prayers and poppies and showed them off at a whole school assembly. 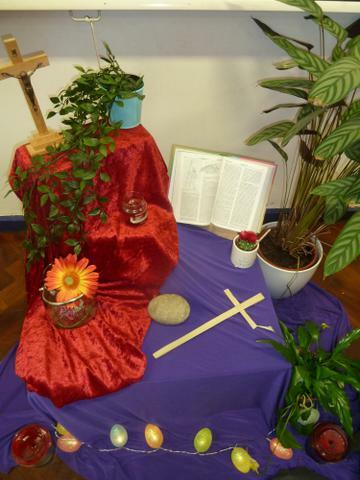 We concluded with a special collective worship session and quiet reflection. Today we saw the launch of our walk to school initiative. The children have to log the ways they get to school each day on an interactive website. If the children walk at least once a week or park a little further away from the school and walk then they will get a monthly badge to show that they are trying to get healthier! Children also get rewarded for scooting and riding to school. Bikes and scooters can now be stored in our brand new bike hut outside the nursery entrance. This initiative aims to get children and their families healthier, more fresh air and vitamin D, spending quality time together to encourage conversation on the way to school as well as being better for the environment - a subject our children are very aware of currently! This week we have been collecting food for a local foodbank. We had a harvest assembly in school and the children were keen to share some of what they had with others. We took a record number of bags and boxes which were gratefully received. Many thanks to our generous parents and children. 19th July 2018 - Year 5 are on a mission to save the world!!! The children in year 5 have been learning about the environment during their come and see lessons - they decided to take their learning further and try to make a difference! They had a competition to design a presentation about the environment that they could share with their parents. The quality of the presentations was outstanding and MRS Merriman couldn't decide.....so they presented them all. The presentations included prayers, poems, songs and lots of information about the environment. Fantastic Job year 5! Year 3 and 4 children held an afternoon for parents to teach them about the works of Fairtrade. We started off with a collective worship led by the children. 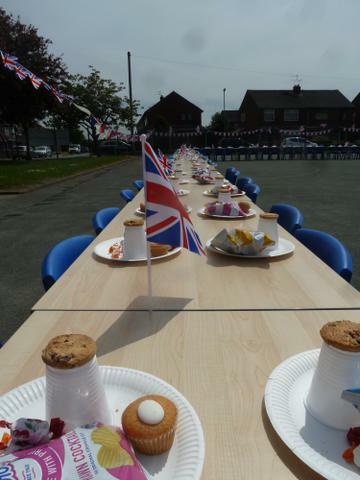 They then set about serving the parents tea and coffee and of course cake! The children then played a variety of fair trade games - bingo, world cup quiz and a fair trade board game. A great (and hot) afternoon. Well done year 3 and 4! Over £120 to add to our morning total from year 6! Year 6 Fair Trade Cake stall. Year 6 have been learning about Fair trade as part of their Come and See topic. They decided that they wanted to do something to help so organised a cake sale. 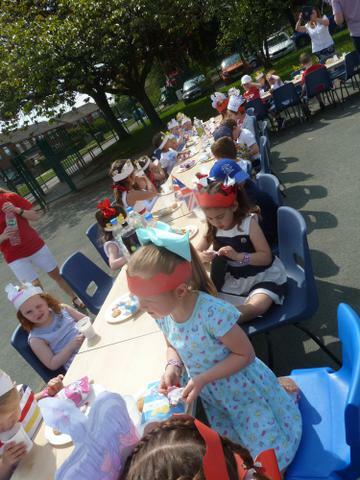 They set about with their families to make hundreds of cakes! They raised over £150! Fantastic effort everyone! 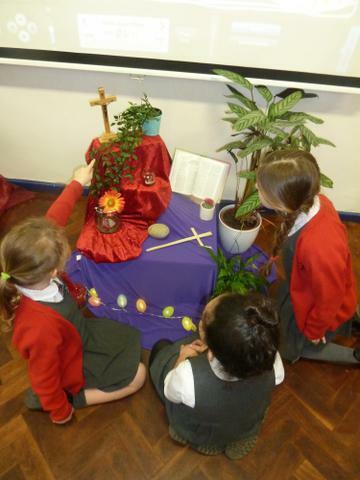 Today the children all had the opportunity to pause, think, pray and help. It was a day of reflection for what refugees all around the world are going through and to give thanks for all the wonderful things that we have in our lives that we maybe take for granted. We were lucky to have a very enthusiastic volunteer from CAFOD joining us for the day and leading our 'Share the journey' walk. The pope has asked us all to walk in solidarity with the refugees and his aim was together we could walk around the world - we added 200 miles to the totaliser on the day and now Catholics all around the world have walked enough steps to go around the world 3 times! The older children took part in a refugee workshop where they had to make some difficult decisions that real refugees would have to make - this led to some fantastic and at time challenging discussions! The children also took part in a safe places workshop - encouraging them to think about places where they felt safe and happy. They then looked at children in other countries that no longer have a safe place. The children could then design and create a new safe place for the refugees by making dens in the forest. They also had the oppurtunity to write their own prayers. As part of the day, all children were able to help design our new entrance hall display, painting the mural, making fish and decorating pebbles. 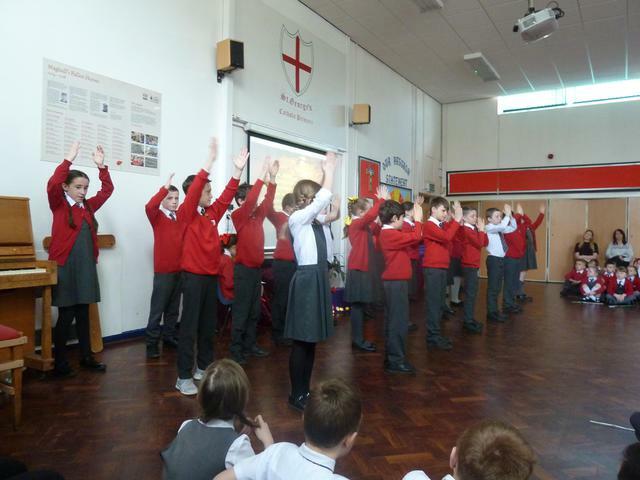 All children joined in with enthusiasm and reverence and respect - well sone everyone! Congratulations to our amazing year 4 class who have just made their First Holy Communion! They all looked fabulous and were a credit to both their families and to St George's. Many thanks to the catechists and to Fr Kelly for a lovely service. 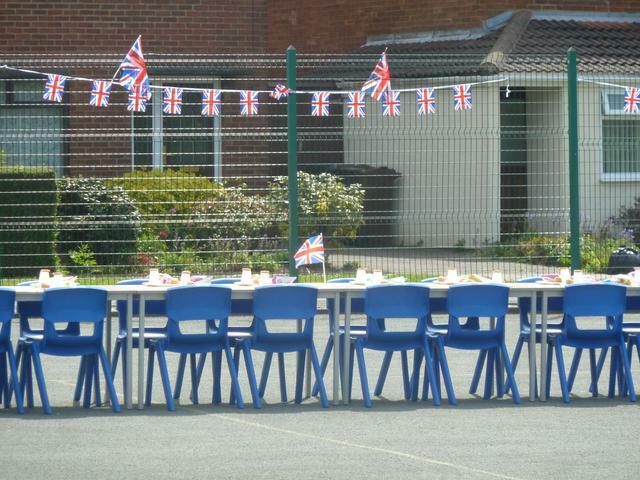 Today at St George's we hosted our own Royal Wedding Celebrations! 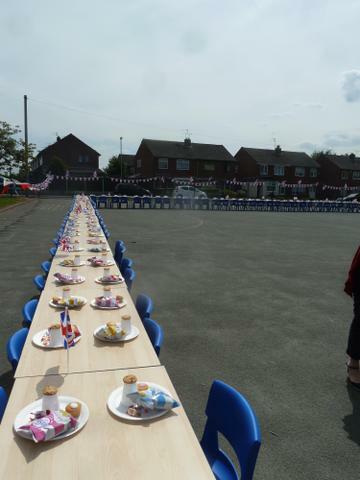 We Just love an excuse for a party and decided to invite all of the children to a street party. We even had a visit from a Prince Harry and Meghan lookalike..... see if you can spot them! The afternoon was a great success and will, I'm sure, be a treasured memory for the children of their time at St George's. 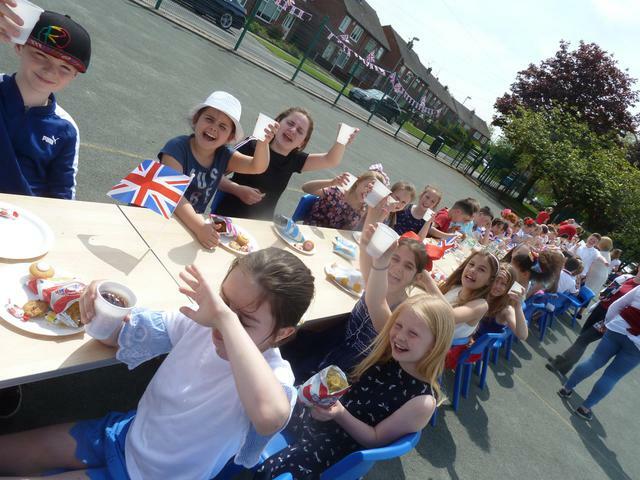 Many thanks to the children who helped with the monumental table and chair removals, the staff who gave up their lunchtime to help set up the party and to Mr Chapman for providing all of the party food! 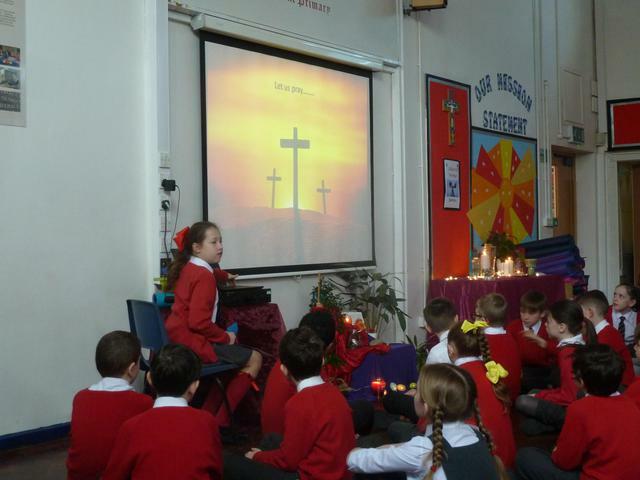 Today we have celebrated Easter through a whole school assembly. Last year you may remember that we created the stations of the cross through silhouettes using just black and white. This year we injected a bit of colour back into the Easter story. The focus was on the poem 'The Colours of Easter'. Each class took one of the colours and chose how to tell the appropriate part of the Easter story. The whole school came together on the last day of the spring term to perform their colour to the rest of the school. 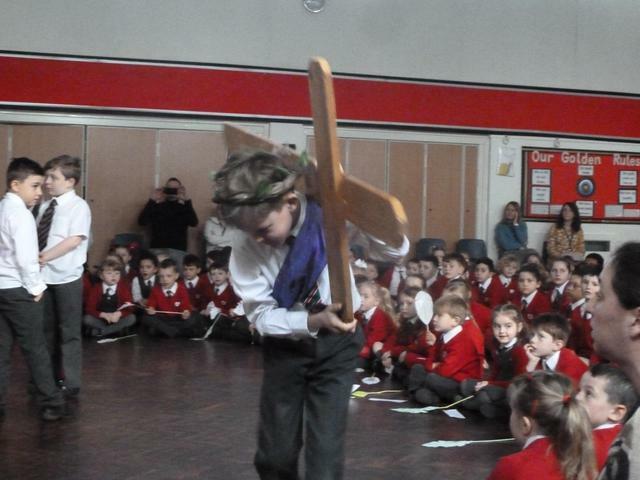 The children told the story of Easter through drama, song, dance and poetry. 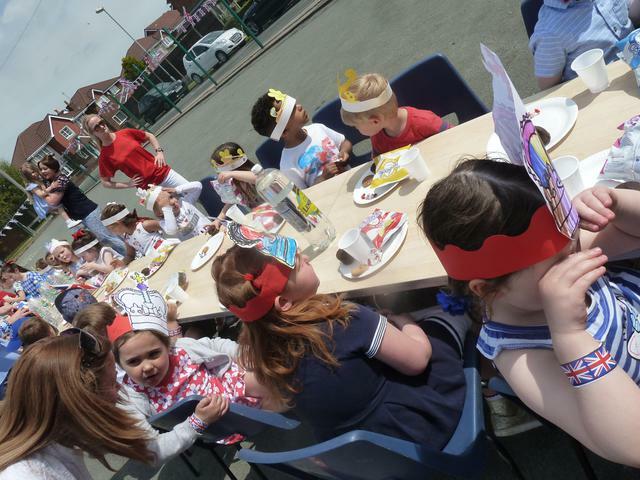 Each class had fantastic and creative ideas and it was lovely to see every child involved from nursery to year 6. 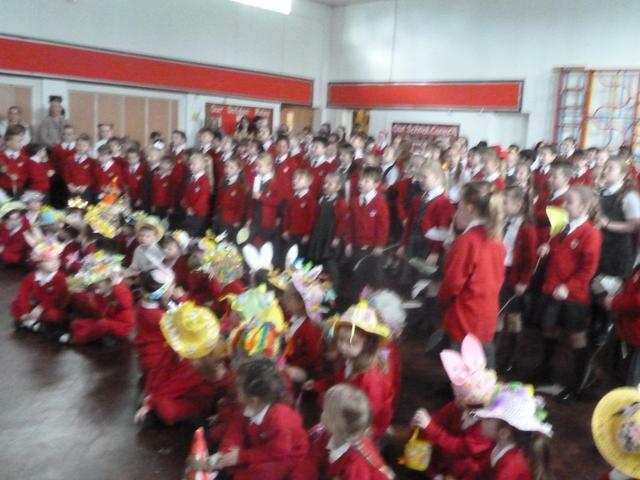 The assembly really was a celebration of Easter.... we even found some chocolate eggs to finish it off! Many thanks to all the staff and children who worked so hard to pull it altogether. We have once again been collecting for CAFOD during Lent this year. Each class were given a pyramid collecting box and asked to bring in spare change. During our beginning Lent assembly we looked at giving things up for Lent, alms giving and helping those who are in need. Our year 5 children decided that this was not enough! They decided to hold a CAFOD afternoon and set about planning their activities. They made mosters, collected items to sell, made cakes and found prizes for games. 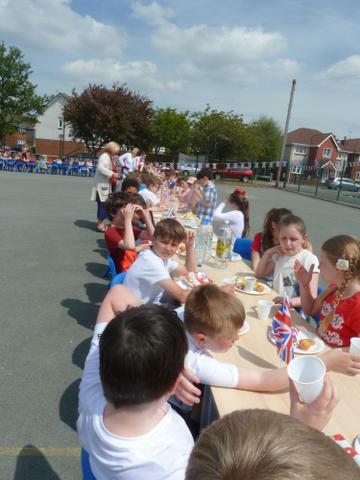 Each class has the opportunity to visit the year 5 class throughout the afternoon to spend their money. Looking at the photos they all had a fantastic time. Year 5 raised £230 in one afternoon! An amazing achievement well done children! 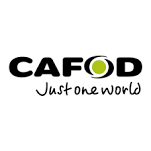 In total school have raised nearly £300 for CAFOD this Lent. We are hoping that the government will now double this amount and that many more people can be helped. 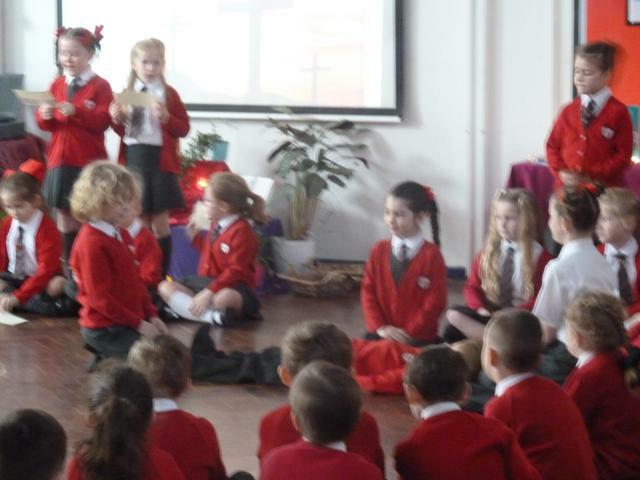 Year 3 and 4 took part in the Baptist Church Advent service today. We were asked to sing some Christmas songs as part of their liturgy. We walked over not quite knowing what to expect. The children had a warm welcome from the Church and were asked to help light the Advent candles. 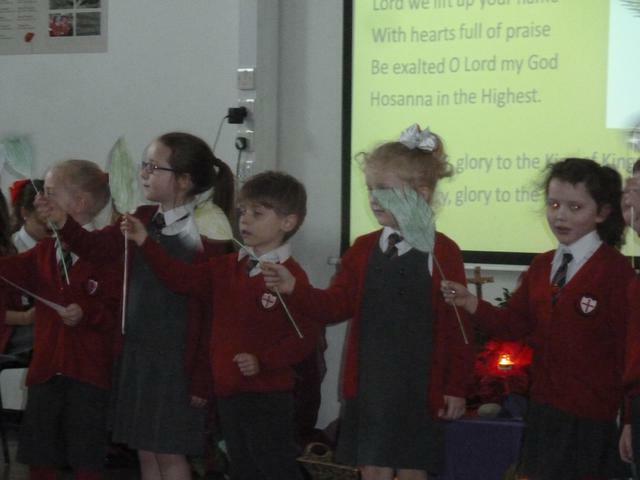 The children sang lots of songs from our upcoming Christmas play Hosanna Rock. We had the congregation rocking and rolling with us whilst telling them the story of the Nativity. 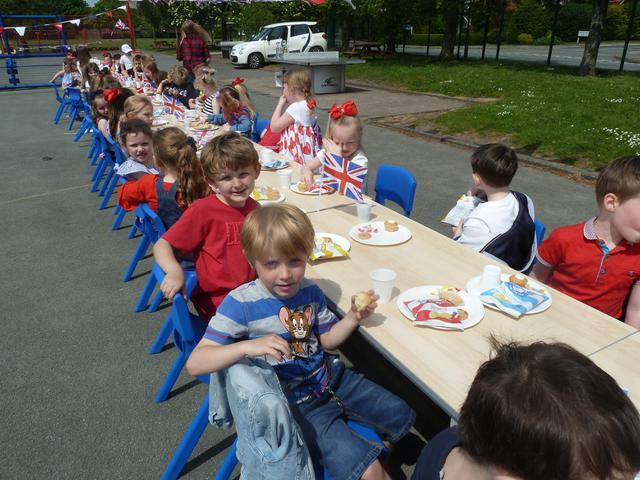 After our performance the children were treated to cake and juice which went down really well. Many thanks to all the team at the Baptist Church, see you again next year. The year 3 children hopped onto the minibus (Thanks Mr Roy) for an Advent adventure. We visited the Anglican Cathedral and took part in lots of different advent activities. We acted, listened, made and coloured our way through the day. We had a guided tour of the cathedral and were amazed at the sheer size of the cathedral. We finished by having an advent service together with all the other schools there for the day. Today the children learnt about two of our most important saints. We had an assembly where we learnt a few interesting facts about each of the two saints and introduced the afternoons activities. Den making - St Paul is the patron saint of tent making! Blind man buff and blindfold assault course - St Paul was struck blind after his conversion on the road to Damascus and his friends had to lead him. Shipwrecked craft - St Paul was shipwrecked, his faith saved him and others. Changes promises - St Paul started off persecuting Christians but changed his ways after the encounter with Jesus. We thought of things that we wanted to change in our lives and asked God to help us achieve them. Rock painting - St Peter is the rock on which the church was built he was our first Pope. Footprints - St Peter walked miles and miles preaching about God, he is the patron saint of healthy feet! 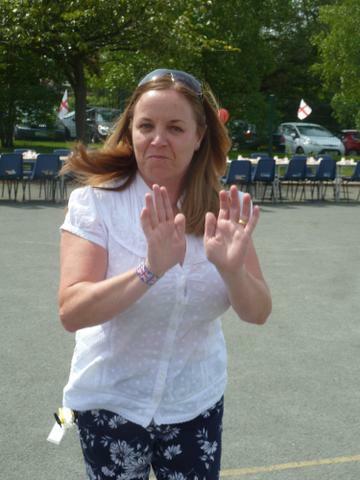 This was a favourite activity!!!! I will follow Jesus fish - Peter was a fisherman who when asked, left everything to follow Jesus. Fisher men game - Jesus called Peter a fisher of men, we had to catch people in our nets. Stations of the Cross afternoon. Today all of the children from Reception to y6 took part in our Stations afternoon. Each class teacher was responsible for sharing 2 stations with the children and decorating 2 station images to be displayed in school. Each class moved around the school throughout the afternoon and listened to music, said prayers and learnt about the journey that Jesus made. 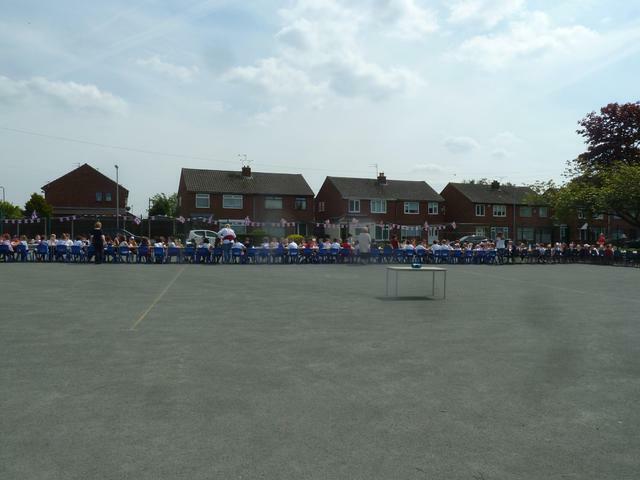 The children moved around the school with reverence and calm. They joined in with the prayers and reflections in each class and were amazingly thoughtful and spiritual in their ideas and contributions. At the end of the afternoon, the children all came together to share an assembly and showcase all of the stations images. We finished with prayers, songs and best of all some hot cross buns! Well done everyone who helped to make this afternoon such a prayerful and lovely experience for our children. Year 4 were on a mission to find out about the jobs that people had in the Parish. They quizzed Father Kelly about his job, how many hours he worked and whether he got overtime! The children were surprised to find out that Fr Kelly was on call all day and all night! 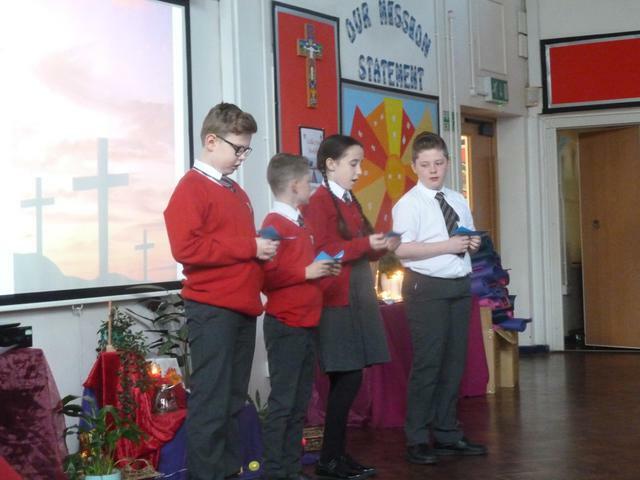 The children also asked about other roles that people had in church and realised that it takes a lot of people to help get the church ready for mass each day. Many thanks to Fr Kelly for his visit. MANY THANKS TO ALL OUR FAMILIES WHO MADE A SHOEBOX FOR CHILDREN WHO WILL NOT HAVE ANY PRESENTS THIS YEAR FOR CHRISTMAS. THIS YEAR WE HAD 60 BOXES DONATED. All children from Nursery to year 5 took part in a Judaism day today. Jeremy took each class and explained a different part of the Jewish religion. Foundation stage learnt a song about God being to our left, right, up, down and all around. They also learnt the story of the candle and the oil and about the menorah candle. All the children had a lovely time with Jeremy and learnt so much about the Jewish religion. Many thanks Jeremy! Today the children had a visit from the lovely Collette from CAFOD. She was helping us to further understand our Collective Worship topic of harvest. Earlier in the week the children had been looking at harvest in our country and bringing in items of food to help people here. The CAFOD assembly today was an opportunity to see how we can help others with their harvest in other countries. Many thanks to Collette for giving up her time today and many thanks to our children and families for their very generous donations of food and household items, these will be donated to the Maghull foodbank. Harvest Assembly and Collection for the Maghull Foodbank. Huge thanks to everyone for our very successful Macmillan Coffee Morning, our busiest and most successful yet. The total raised was just short of £470!!!!!! Not only that but we are hopeful of ‘matched funding’ so the grand total will be £940. It’s a credit to the children and parents of the school and their generosity for such a brilliant cause. Thank you all so much. Today we had the opportunity to stop our lessons and reflect on ourselves and others in the world. We decided to link the Year of Mercy with Laudato Si, two of our Pope's big tasks for this year. He wanted us to show mercy to others in different ways as well as thinking about how we can help protect our world for future generations. We started our day altogether in an assembly. We heard all about Mercy and what it meant as well as watching an animation of Laudato si. We walked through our own Door of Mercy, the aim being to have a new start and to have the opportunity to change ourselves for the better. Below is a series of photos to show how we got on!!!!! The children had to move around the different stations and reflect on how the refugee children from around the world must be feeling. They joined in with prayers and reflections before working together to write a prayer of hope for all those affected. The children realised that these children were just the same as themselves, with the same hopes, dreams and wishes. They were amazing in their reflections and attitudes to this challenging topic and really taught the adults in the group a thing or two about spirituality! We were lucky enough to have the use of the real Lampedusa cross today - a cross made of the wreckage of a refugee boat in 2013. A carpenter from Lampedusa made the cross as a symbol of hope for refugees. This made the pilgrimage extra special for both the children and the staff. We also made the Liverpool CAFOD blog with our pilgrimage! Mercy - To provide Shelter for others / To pray for those who have nowhere to live. Here the children had the opportunity to make the best den they could make. They were also encouraged to think about how it would feel to have no home and to live in refugee camps. The children then wrote a prayer to ask God to look after those who have no homes again they were very reflective with their ideas. This was one of the most popular activities of the day! Mercy - To respect others and the environment / To learn how to look after our world. Here the children look at images of what is happening to the world around us and what we have been doing to our world. We said a prayer and looked at a Cafod reflection card. We had the chance to recycle hundreds of plastic bottle bottoms (the bottles were used to build our eco greenhouses). We also wrote a prayer / promis about how we can help look after the world. Mercy - Give drink to the thirsty / Saving the environment. Here the children looked at a video of how children in different parts of the world have to walk for hours to collect their own water and how they may have to drink water that is not clean or safe. We looked at what we use water for and the different ways we can save water. We had water races carrying pots of water on our heads and decided that we wouldn't like to have to do this each day! We made water promises - a practical way that we are going to save water over the coming weeks. Here the children watched a brief video about the world. They thought about the impact they had on the world, what they liked best about the world. Each child made a promise of one thing they were going to do to help save the world. They drew pictures of the animals and plants, wrote prayers thanking God for all the amazing things He has made for us. The children also wrote prayers for different people around the world. They wrote the people onto their hand shape, these were then made into prayer flowers. We finished our day with a whole school collective worship. We acted out scripture where Jesus explains about mercy. We included some of our prayers, pictures and promises. We listened to some reflective music thought about all the things we had done today. Every person then got to come forward and place a pebble in the water the point being that individuals can all do just one thing and it will make a difference - the water overflowed once everyone had put in their promise. Many thanks to everybody who helped to make this day a spirituality day to remember!! We all had the opportunity to get dressed up again today! We had our Communion photos taken, performed our song and ate cake! We all had a lovely morning. 11th June First Holy Communions. Congratulations to our fabulous Year 4's on making their First Holy Communion yesterday. We hope that you all had a wonderful (if a bit damp) day! Many thanks also to our wonderful musicians and choir who came along to help us celebrate. We were lucky enough to get a visit from John McCorkell www.itsallnormal.com. John came to explore the word 'Disability' with our children through a Christian perspective saying that we are all perfect in God's image and that we all have gifts to share. John started his day with a whole school assembly and to say you could hear a pin drop was an understatement, the children listened to his every word and were a real credit to our school. John then took each class R-Y6 for a class workshop where they tried out a wheelchair and learnt how it feels to have a variety of disabilities. The children all found the day highly worthwhile and it was summed up at assembly the following day. We asked our children how they could show Mercy to others and we looked with them at the Corporal and Spiritual works of Mercy. The first idea they had was to help those who had nothing, they wanted to help the refugees who were arriving in our country with empty handed. They wanted in particular to help children. We got in touch with a charity called MRANG who specialise in helping mothers and babies. These women have faced the most awful experiences possible and face having their babies in hospital without even a nappy to put on their child. Our families have been so generous in donating items that will help both the women and their babies and we managed to take 5 big bin bags full of clothes, nappies, wipes and all manner of baby things to the headquarters in Liverpool! A massive THANK YOU to all those who donated to such a worthy cause! On the 4th March Nursery and Reception braved the snow and rain and headed for Church! We were learning how it feels to be gathered together in one place to hear about Jesus. We sang our 'Gather together' song and listened to a special story out of the Bible. We then had a hunt to find some special objects around the church. 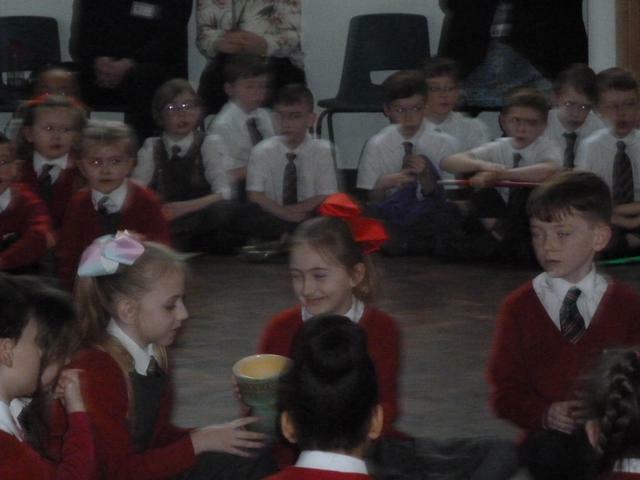 Some children learnt how to bless themselves with Holy water. 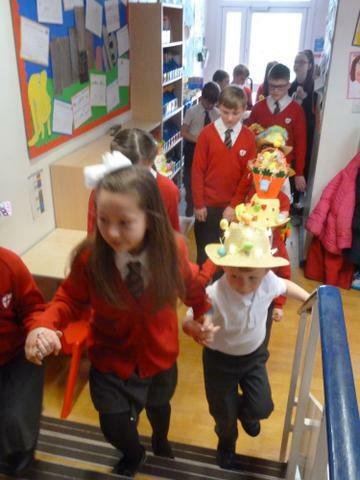 On the way home some of the reception children decided to sing 'Church songs' in LATIN all ....the.....way....home! With a quick stop to feed some ducks we eventually all arrived safely back at school. "That was a great adventure said Charly can we go again tomorrow?" On Friday the 8th of January some of our children were taken to the Cathedral for an Epiphany service. We took the Three Kings, Mary and Joseph, a Donkey and an Angel from both the key stage 1 and key stage 2 Christmas Nativities. 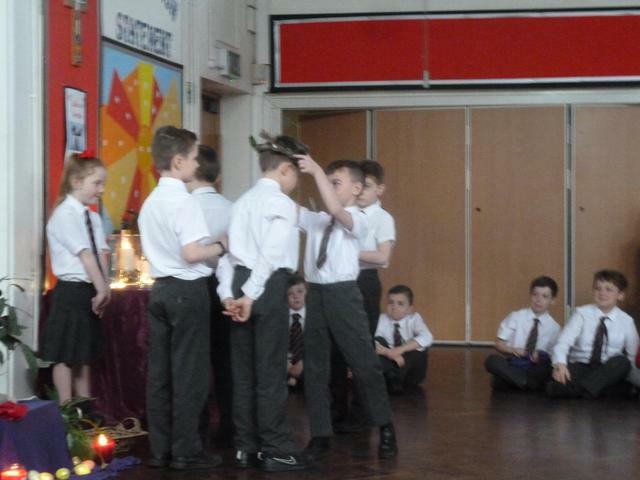 We learnt about the kings or wise men and joined in with blessings, prayers and hymns. The children behaved fantastically throughout the service and were amazed by the Cathedral itself. We would have loved to have had the time to explore more so if you get the opportunity for a visit then please do take your children for a proper look around. Many thanks to Mr Roy for his minibus service. Our Year 4 children have just made their Confirmation! Archbishop Malcolm wrote a letter to Fr.Kelly to tell him how lovely it was to meet all the children and how much he enjoyed the celebration. We are extremely proud of our year 4 children and their parents well done! We were lucky enough to have a visit from Ivor this week. He came from the Jewish Centre Liverpool to help us learn all about various Jewish celebrations. We loved looking at the artefacts that he let us touch and enjoyed eating the special Sabbath bread his wife had made especially for us.